A decade ago, a tour like this in the States would have been inconceivable. Just goes to show the tremendous push of classic/veteran metal bands…they won’t die off; neither will their audience. 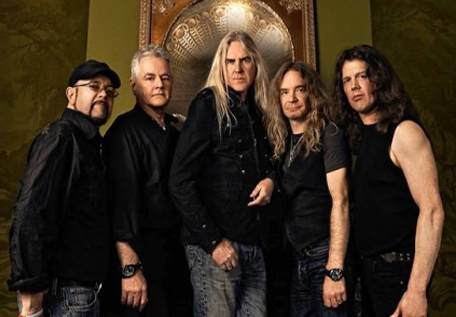 For Saxon, trips around the States are infrequent, the band remaining a European festival standby, which explains their enduring popularity. Armored Saint, though, are a part-time band, choosing to release an album every ten years, or in the case of this year’s Win Hands Down, five. (In comparison, Saxon are pumping ’em out on a bi-annual basis.) Either way, just a fantastic bill all around, livened up Matt Coe favorite MindMaze, who opened proceedings with a stratospheric 30-minute set. It is of the scribe’s opinion that John Bush is one of the best metal singers ever. His throaty, melodic-attack-mode voice is one-of-a-kind; the man has no equal in America, and probably even Europe. His work in Anthrax is massively underrated, but in Armored Saint, he’s rightfully at home. The band’s set was a wise mix of newer songs ala “Win Hands Down,” “An Exercise in Debauchery” and the throttling “Left Hook From Right Field,” which saw Bush climb a stack of speakers for the song’s duration. Of course the heroic “March of the Saint,” would-be radio smash from 1991 “Last Train Home” were aired, the latter demonstrating Jeff Duncan’s fluid lead work. But it was mainly the Bush show. Dressed in casual garb (flannel shirt, black, tribal-patterned exercise pants; translation: I don’t care what anyone thinks), Bush sounds as pristine and lean as he did in his 20s. Set closers “Reign of Fire” and “Can U Deliver,” went down in a storm, well after Bush announced to the crowd that it was Armored Saint’s first time in Pittsburgh ever. One should have seen the look of surprise on the band’s face as they exited to chants of “Armored Saint!” “Armored Saint!” May they return in a hurry. Touring on the ramp-up to their 20th (!) studio album Battering Ram, Saxon certainly beat Armored Saint in the volume department, with Biff Byford and the boys totally cranked for the first few songs of their set. Once the sound was put in place, it was a lengthy, sturdy display of tried-and-true NWOBHM. ‘Ole Biff strolls the stage in command, playing with the crowd, launching water bottles (one of which landed at this scribe’s feet – darn wet socks! 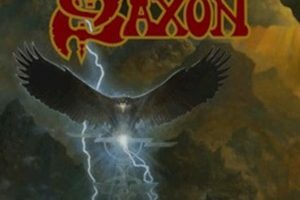 ), and playing a game of “Choose that song.” Rare seeing a band give the audience a chance to choose songs for airing, but that’s exactly what Saxon did on a handful of occasions. Down the line, all sorts of reliable cuts: “Wheels of Steel,” “Denim and Leather,” “This Town Knows How Rock,” “Strong Arm of the Law,” and the proverbial, “Crusader.” For a bunch of gents well into their 50s and 60s, the pure love of heavy metal has kept Saxon going. And like Motorhead, they’ll probably keep going until the wheels fall off.